I agree with you GNV, this is borderline unethical. The customer was given no prior information about the ridiculously long delivery time. I also feel this is the reason why the gun is relatively expensive. They're machining and assembling each gun individually on a per order basis instead of mass producing them. Hello GNV, don't know if GST and its implementation could be the potential cause of the delay Looking forward to your review once you do receive it! GNV wrote: Thank You Pratik. Only today I called the Precihole Sports and they told me that it would take another 2 -3 weeks to dispatch my gun. It seems as if they are starting to make the gun after they received the payment only. On a positive note, perhaps a very special one is being made for the guru! Please cut that "garu" stuff. My friends call me GNV and I consider you as a friend and think you do too. I really don't think they would do anything stupid thing like that .. I am a novice when it comes to PCPs. Not that I am a guru with springers either. I am just a reporter and report things from my point of view. There are lot of knowledgeable people in the forum and they don't post detailed reviews like I do just because they don't have the time it takes to do a review. And I post the kind of reviews I do because I love it and have the patience and time to do them. And Dr.Shirsat don't even know me in person. Interaction between us only through a few emails about the problems I faced with his earlier guns and he was always helpful. However he did sell me a Receiver and barrel set specially fitted without any barrel droop specifically for scope use at a highly discounted price and I am grateful to him for that. However I did request Dr.Shirsat to make sure that my PCP would deliver full 15 ft-lbs with Precipell 8.7 gr Field Target Pellets. And to send a fill probe which can be fitted to a Hill pump. If they are making a gun only after they a receive a full paid order and not yet started mass production that is bad. In this scenario every gun would be a custom gun and differs from every other gun produced. It could be bad or good. Good because each gun could be fine tuned at the factory for better performance. Bad because one could never be sure if regular production guns perform the same way. Talking of Pricipel, I really like the quality of that pellet. Suits RWS 34 like a charm. I was looking at picking up the px100 club pro and was told by them that currently only the regular version is in stock. The club pro is under production and will be available in the first week of August. Really wonder what's up. Is it that they are having quality issues considering this is a new product.As pointed out earlier quality will be guaranteed only when we see true mass production. I think this is a catch 22 situation. It seems there aren't enough orders to start mass production. And people wouldn't order unless mass production started. Spending some 14 K on a springer/ Nitro Piston is one thing but spending 30K for gun and another 16k for a pump and possibly more for a scuba tank if facilities are available for filling it locally is quite another thing. Now there are more options in Springers than before PH was launched. AARMR at around 9k is as good as any PH SX series if not more powerful. At lower price range there is SDB. Right now in Springers there is a healthy competition. You can find a good AR in whatever price range you want between those three brands. PH introduced SPARTAN because of this competition. Springers survived even after THEOBEN invented Gas Ram. But THEOBEN went out of business. Nitro Pistons have their own advantages and disadvantages. In India airguns are primarily for recreational and hobby shooting. There is no hunting here. The real advantage of a gas ram is its ability to be kept in cocked position for a long time without affecting the gun. But it is not necessary to do that in hobby shooting. Here consistent accuracy is more important. PCPs too have their own advantages and disadvantages. Major disadvantage is costs involved. Advantages are many. It can be a repeater. More accurate at longer ranges than a springer or NP. Easier to shoot . Completely recoil less. Don't need a springer rated scope. Any inexpensive scope would do. But if I am spending nearly 60K for a PCP and required equipment I need assured quality and trouble free performance for years backed with after sales service. is a considerable market for reliable PCPs. Only PH has to gain the confidence of that market if it wants to succeed in their PCP venture. 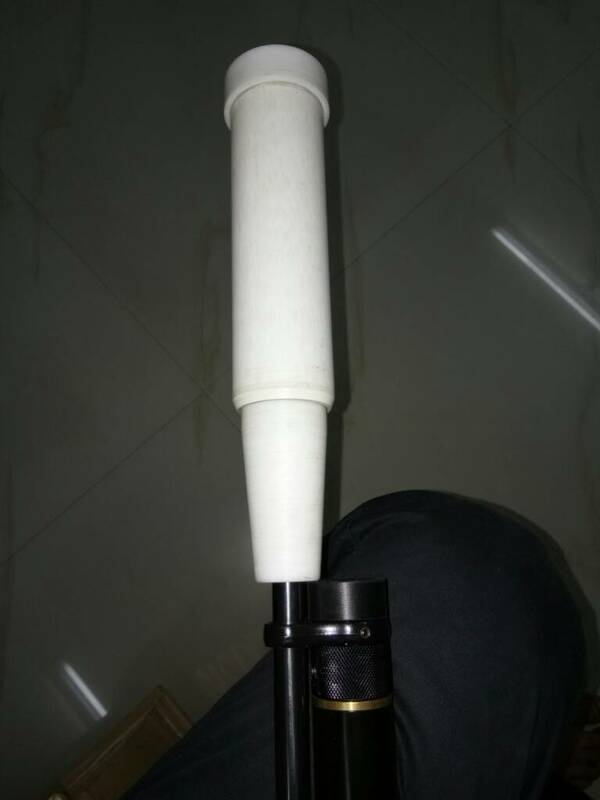 Finally I have made my own designed compensator for PH PCP and it is reducing the noise level quite well upto 10 dB. I have taken a 1-1/4 inch size pvc pipe and inner insert machined out of Teflon. Have drilled a holes at the slots and filled a cotton inside it. And it is working well. With no offence to sir GNV, I do hope the PCP you receive is straight off the production line with no special extra attention given whatsoever component to make it perform better or make it more reliable. I say this for the sake of all those waiting for your valuable review. odedratushar wrote: Finally I have made my own designed compensator for PH PCP and it is reducing the noise level quite well upto 10 dB. 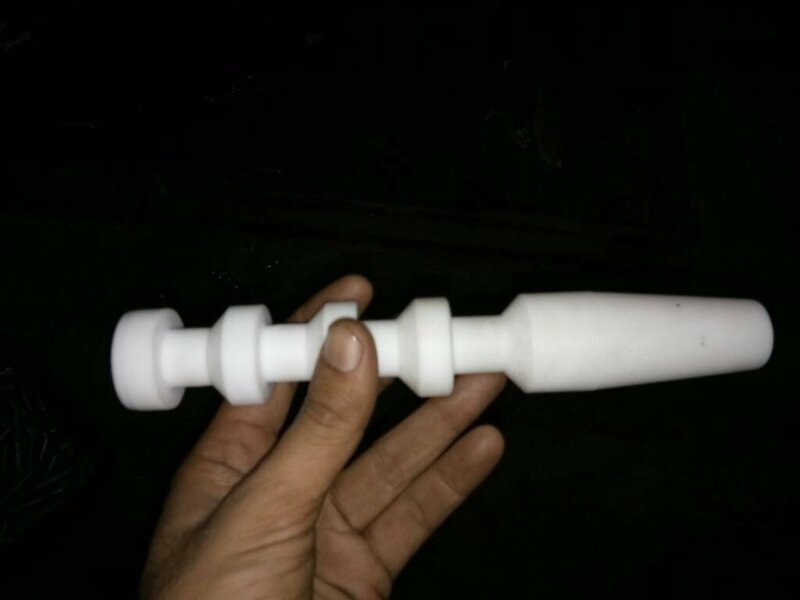 Where can one source a Teflon Tube with inner dia that fits the gun barrel and outer dia that fits inside a 1 1/4" dia PVC pipe ? Or have you taken a solid Teflon Rod and had it drilled through? Have taken a solid Teflon round bar and done drilling and machining. GNV wrote: Received the Hill Pump Mk-4 from amazon.in. Now the wait for the PCP begins. I received mine today from airgun india for 16500/- and from all accounts looks like a genuine piece with no significant tooling marks ,packing and stuff.Packing was good enough and looking at the price update from GNV it cross subsidised my future pcp by 5k !Will need to wait couple of months to test it though .GNV's review will definitely one of the deciding factors ..Our own BB Pelletier ,the better one of course ! Dear members, there are a few finer details about silencers/suppressors/moderators here. As per the new rules, silencers/suppressors/moderators require licenses. However, in case of air rifles that do not need license, that requirement does not apply. If someone has more information on that, do feel free to share. Cheers. Vikram wrote: However, in case of air rifles that do not need license, that requirement does not apply. If someone has more information on that, do feel free to share. Cheers. Thanks Vikram, learnt something new. I was of the opening the old rule held. Only silencers on firearms were banned even before. Air Rifles don't need any license for silencer/moderator/suppressor. Only I don't think that license for silencers for firearms for would ever be issued. Why would a civilian need a silencer. Only those special operations guys need them. Or the Goons.